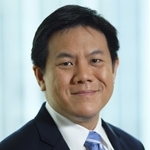 Executive Vice-President, Singapore Exchange Ltd.
Chew Sutat is Head of Sales & Clients and is responsible for the exchange’s international distribution network including growing market participation and the Membership base in securities, derivatives, commodities and data products. Mr Chew joined SGX in June 2007 and was appointed to the Executive Committee in May 2008. He was previously Group Head, Investment & Treasury Products at Standard Chartered Bank. He was responsible for the Global Wealth Management investment and treasury products business, strategy and development in the bank’s existing geographic franchises as well as new ventures. Before Standard Chartered Bank, Mr Chew was with OCBC Securities, where he headed the development of non-traditional investment products and services for its customers. He began his career with DBS Bank in the Custody function, and held varying portfolios in strategic planning and business development for institutional banking, as well as private clients. Mr Chew graduated with a Bachelor of Arts (1st Class Honours) degree in Philosophy Politics & Economics (PPE) from Oxford University, Keble College in 1996. He also holds a Master of Arts degree from Oxford.